All transactions are safe and secure with a reliable history in online purchasing behind each of our associates. Buy the Spider-Man and Green Goblin t-shirt to own Spider-Man clothing and merchandise. The Spidey t-shirt on the left is an excellent addition to any collection of Spider-Man clothes. 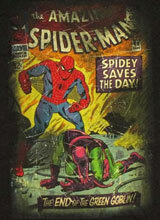 The front of the tee displays the cover art featured on The Amazing Spider-Man comic book issue #40 (1966). The artwork reveals that Spider-Man saves the day by defeating the Green Goblin. Created by Marvel and Stan Lee, this issue follows issue #39 where the web slinger behind the costume, Peter Parker, is revealed to the Green Goblin, who then reveals his true identity to Parker. Pair it with Venom clothing. In addition to the Spider-Man and Green Goblin tee above, browse the Spider-Man Clothing Gallery for more apparel like men's and women's clothes, kids shirts or hoodies.